Scraps of Darkness and Scraps of Elegance: Two fabulous layouts from Dana! 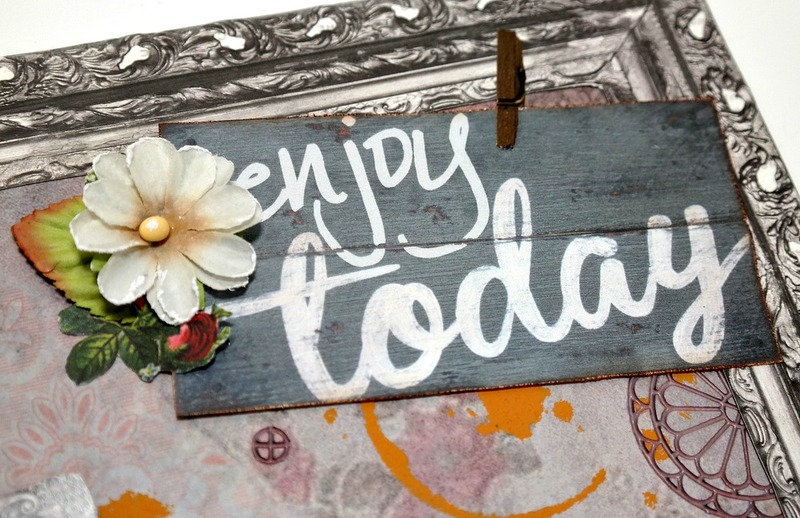 I'm sharing the first layout I created with the Scraps of Darkness May Attic Finds Kit today. The textures and prints in this kit are so fun to work with! 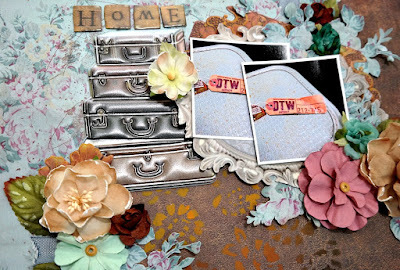 I paired leather and flowers together with a photo of a vintage suitcase I took while visiting the Detroit Antique Mall on a recent trip home for this first page. If you're interested in reading more about the antique treasures that can be found in a large city, CLICK HERE to read my article about my gypsy travels to Detroit, Michigan. I personalized this layout a bit by adding the Detroit area code to the bottom right corner. 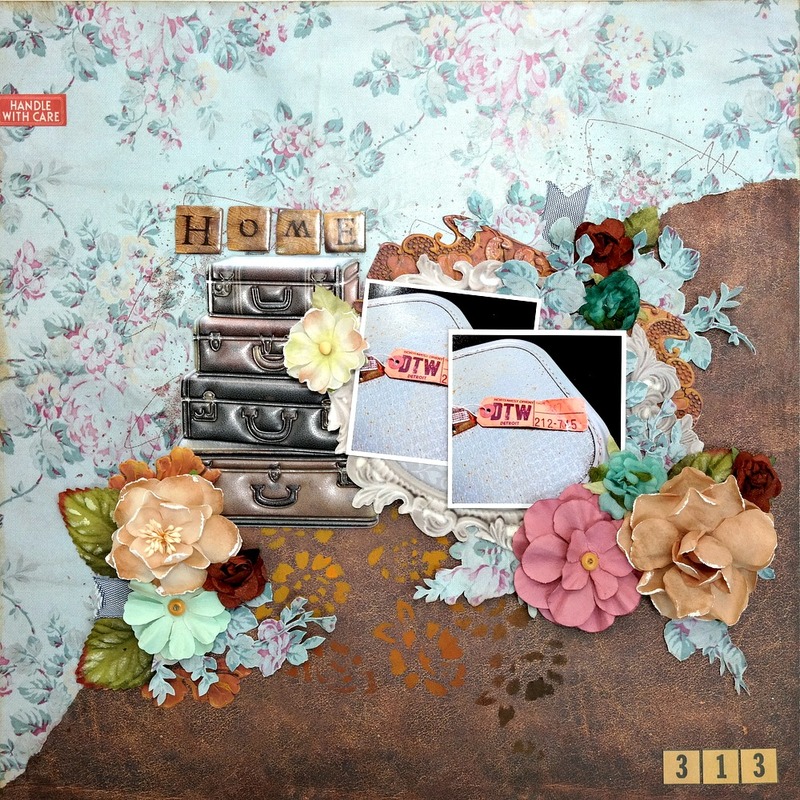 I cut these numbers from the Tim Holtz Idea-ology Emporium Ephemera Pack. I used half a sheet of the Authentique Rugged One patterned paper (May Main Kit) and a half sheet of the 7 Gypsies Architextures Vintage Bunting patterned paper (May Patterned Paper Add-On) for the base of my layout. I used the Prima Wild Flowers 6x6 Stencil (Scraps of Darkness Store) with the Prima Finnabair Art Extravagence Rust Effect Paste Set (May Creativity Add-On) to add a colorful textured pattern onto the Rugged One paper. 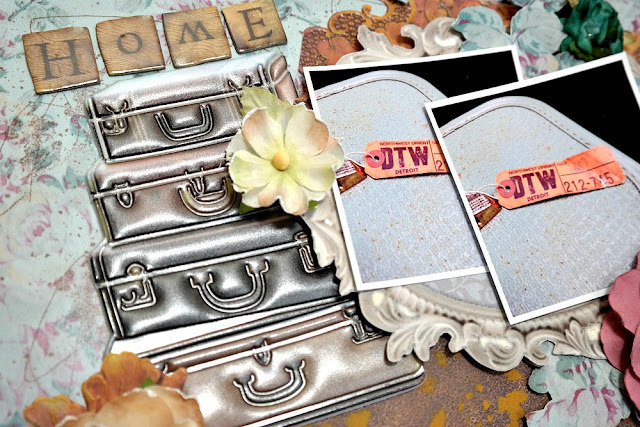 Next, I added the 7 Gypsies Architextures Stacked Suitcases Adhesive Embellishment and one decorative piece from the 7 Gypsies Junque Embellishments Pack to the page (May Elements Add-On). These embellishments look and feel like real leather! I cut a frame for my photos from the 7 Gypsies Architextures Ornate Frames patterned paper (May Patterned Paper Add-On). I tucked fussy cut flower clusters between this frame and my photos. I added a title to the page using Mr. Smith's Workshop Thick Alphabet Stickers (May Elements Add-On). I love the wood burned look! Finally, I added several flower clusters made from the May Floral Add-On to the page. I wrote a companion article that details some of the features of the Architextures embellishment line and more about my antique finds from Detroit, Michigan. If you're interested in some further reading, please CLICK HERE. 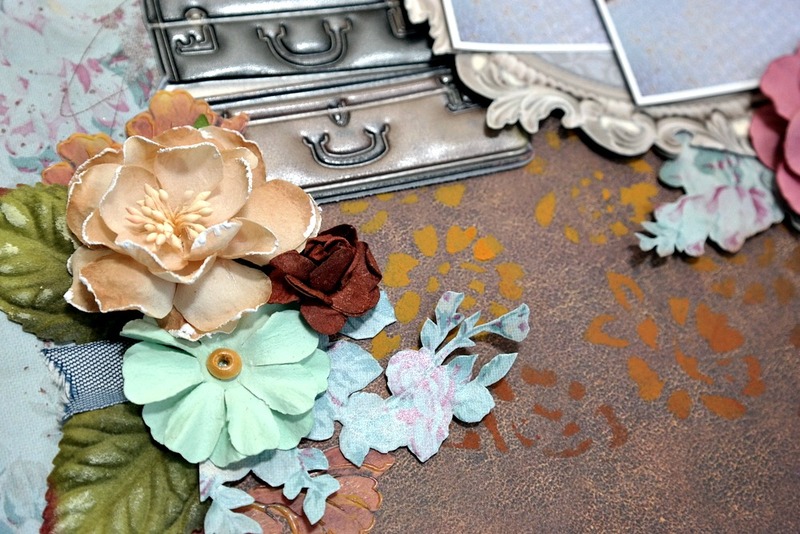 The second layout I've created with the Scraps of Darkness May Attic Finds Kit today. I had a lot of fun playing with frames for this page! I cut both the large frame and the smaller frame around the photo from the 7 Gypsies Architextures Ornate Frames patterned paper (May Patterned Paper Add-On). I think the realistic texture captured on these frames is amazing. 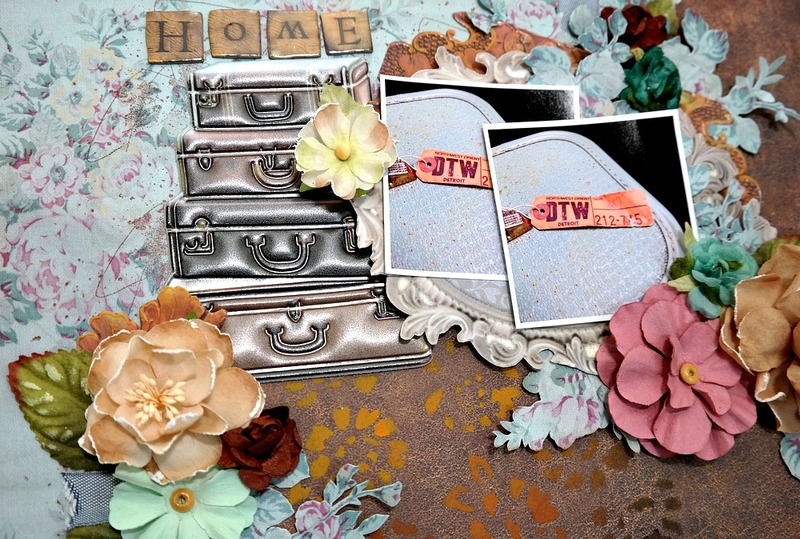 I used the 7 Gypsies Architextures Art Wall patterned paper (Main Kit) for the base of this layout. I loved the peeled floral wall paper and the nail was just perfect for hanging a framed photo on! I cut the gypsy picture from the 7 Gypsies Architextures Old Window patterned paper (Main Kit) and tucked it inside the smaller photo frame. 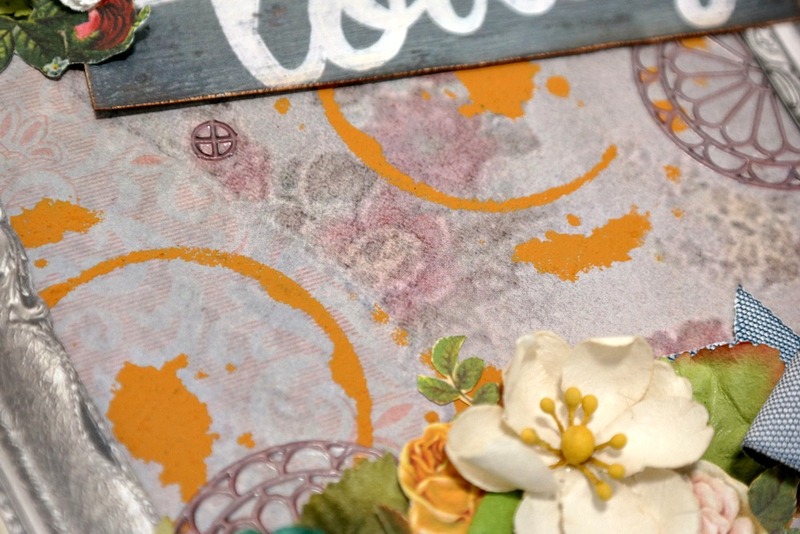 I added a bright pop of rusty orange to the background by spreading Prima Finnabair Art Extravagance Rust Effect Paste (May Creativity Add-On) over the Kaisercraft Splatter Mini Designer Template (Main Kit). 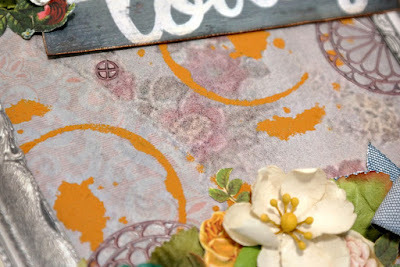 I cut the circles from one of the 7 Gypsies Junque Embellishments and placed them around the page (May Elements Add-On). 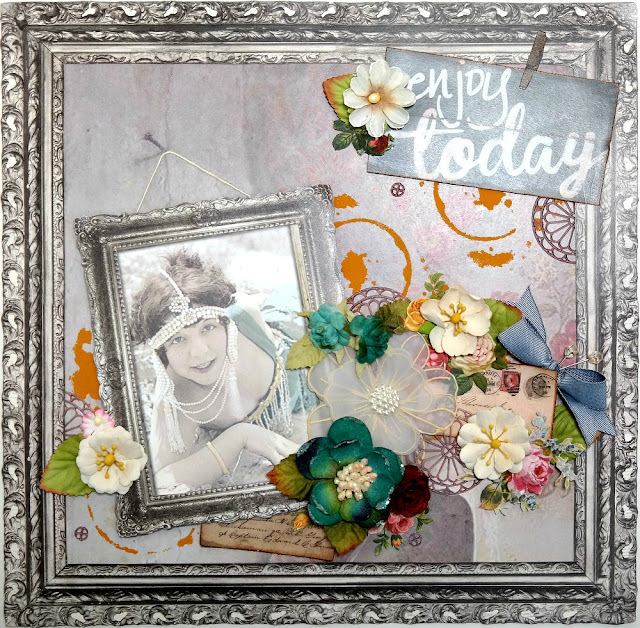 I added flowers from the Main Kit and the May Floral Add-On to the page. 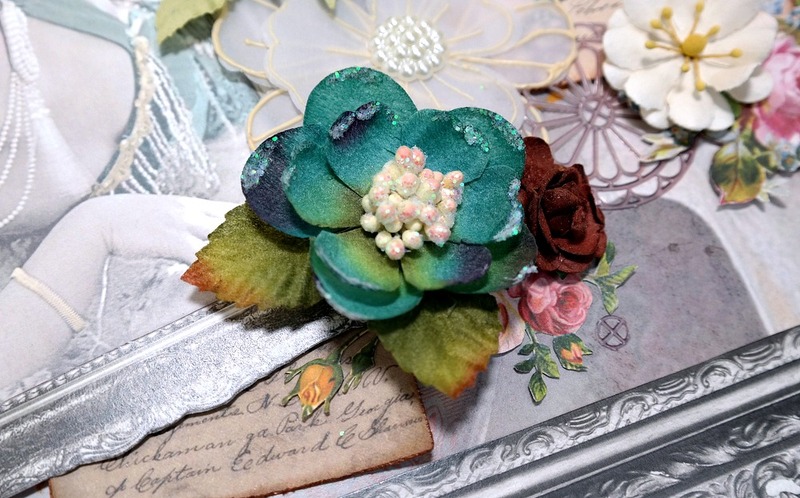 I tucked in paper flowers that I fussy cut from the Tim Holtz Idea-ology Emporium Ephemera Pack and a bow tied from the May Arts Denim Ribbon (Main Kit). 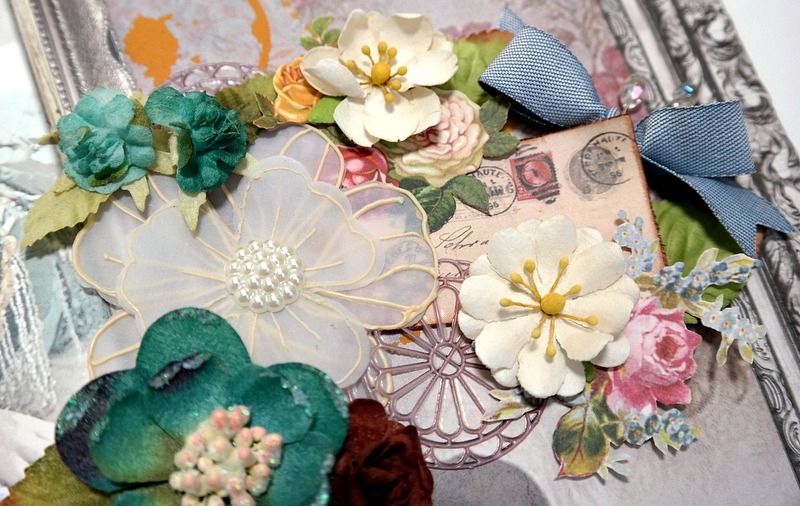 I purchased the gold and pearl vellum flower from the Scraps of Darkness Store. It paired perfectly with the gold and pearls on the woman in the photo that I couldn't resist adding it to the page. I cut the title for this page from the 7 Gypsies Architextures Market Signs patterned paper and "clipped" it to the top corner of the layout. The clothespin holding the sign to the page is actually paper. I cut the small clip from the 7 Gypsies Architextures Ornate Frames patterned paper (May Patterned Paper Add-On)! Several of the May Add-On kits are still available from the Scraps of Darkness Store, but they are going fast! If you don't have a Scraps of Darkness subscription, why not join today?! You can find out more about the club, at ScrapsofDarkness.com. We'd love to see your take on this kit. 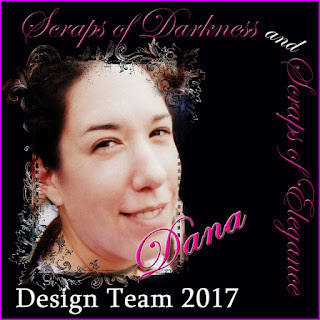 Share your work with us in the Scraps of Darkness and Scraps of Elegance Mixed Media Scrapbooking Community on Facebook.